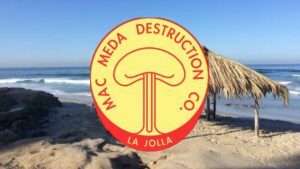 Occasionally, when reading surfing publications, there is a reference to the ‘Mac Meda Destruction Company’ of La Jolla, California. The writer often makes a reference to outrageous parties, drinking beer, wild women, tearing things up, surfing, and generally having a really bitchen time. 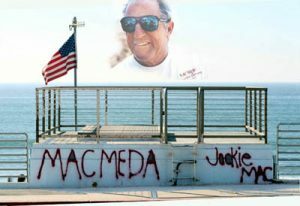 The Mac Meda Destruction Company was started in the early 60’s by Jack Macpherson (Mac) and Bob Rakestraw (Meda). Jack surfed. Rakestraw didn’t. Both lifted weights. The two shared a house at 7436 Girard Street and the stories about the house and their friendship have become legendary. “The party went on for 7 years, 24 hours a day. The door was always open,” Macpherson remembers fondly. Lettermans Jackets with the original Mac Meda Emblem that Tim (Blade) Palmer (l) did and Jack. The location of this photo is at Chris and Al Celada's place in San Felipe. Humm, I always wondered what happened to the Coast/Girard street sign? In their living room, sat an old Zenith TV, which was on the fritz and necessitated occasional light kicks. Jack got tired of getting up and down, so he rigged his shotput on overhead pullies. Rakestraw used to amuse party guests by eating a banana (peel and all). An orange (peel and all). A cube of butter (paper and all). And then he’d finish up with a shot of gasoline. Bob went to jail so often, Jack fixed his bedroom to resemble jail, so Rakestraw would feel at home. The star gorilla at the San Diego Zoo was a magnificent silverback named Albert. Bob was crazy about him and spent every Monday at the gorilla house, just staring at his hero. When Albert became a father, he passed out cigars. Rakestraw’s car. A ’54 Ford. Powder blue. Jack and Rakestraw jumped up and down on the hood until it bent over the carburetor. He wanted a hard top convertible, so the window posts were sawed out. Then the windows were punched out. He painted a picture of a cop on one door and the finger on the other. The two roommates sat in Windansea parking lot and shot out the dashboard dials. Jack figures there were hundreds of holes. The piece de resistance happened at the tennis courts on Draper Street. Jack admits they had been drinking. Someone decided to put a quarter stick of dynamite in the front seat. They crouched down in back. Kaboom. Smoke poured out. The blast bowed the dashboard. The tennis players came running over and the boys played dead. Well, other guys came on board. Charlie Farley, Charger Pat Shea, weight lifter Chris Palmer, skier Stirling Burnett. “There’d be 10 or 20 of us who would go out with sledgehammers, axes and football helmets and wreck an old house. Of course we asked the owners first. Once we did 5 houses and a 40 foot water tower in one day and they were known for pushing cars off Torrey Pines cliffs. 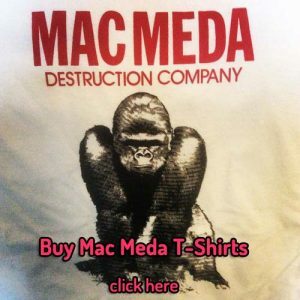 Macpherson and Rakestraw started printing Mac Meda tee shirts, using Mayfair Market bag stencils and red spray paint, in the alley behind Stirling and Joann’s Fay Avenue house. Stickers featuring a mushroom cloud were printed. In 1963, the first Mac Meda Convention was organized in the canyons east of Del Mar. ‘Huge beer orgies,’ Tom Wolfe described the gatherings in his 1966 essay “The Pump-House Gang”. Hundreds of kids would converge in Sorrento Valley, Windansea, Palomar College or Rosarita Beach, clad in Mac Meda tee shirts and carrying cases of beer. His parents had met the great writer in the Caribbean, who had extended an invitation for Ketcham. Up they went in 1959. Jack’s mom loved winter sports and Jack skiied. At night, they partied with Ernest Hemingway. I was bowled over. I asked him “What’d you think of Ernest Hemingway?” “He showed me nothing. He was an old drunk. And furthermore, a year later, I went by to look him up and he had blown his head off. Those Hemingways…they’re always blowing their heads off,”. I saw Rakestraw in action at one of the conventions in Sorrento Valley. I think it was Sorrento Valley. Short story, Rakestraw had issues with some poor fool and went after him. It was 10 feet from where I was sitting. Rakestraw grabbed an antenna from a car and was going to beat this guy with it. His friends around him stopped the action. I remember him grabbing the antenna just as easy as picking daiseys. The strength was impressive, the use was not. Ok I am overdue on this one about Jack and my grandma Dodie. She got nailed in a cross walk on LJ Blvd and had a four pronged cane when we lived on Mesa Way near Brud McGowan. Every day that Jack ran his route she would pace the sidewalk waiting to talk to him (she was 70). He would bring an 8 pack of Ole Stubbies in his mail bag and she and Jack would talk and solve the world’s problems every day. They hated big Gummint. Jack had his fireworks brought in from friends who had moved to Tennessee and Alabama (still legal). Most of them went south of the border. However, occasionally, a streak of the Devil would hit him…as the midnight hour approached, he’d remark casually, “Uh Boop, have you seen my firework launcher?”. I told him to look in the closet. He’d throw out his umbrellas, an AK47, shotput, pool cues, a baseball bat from a 1950s pickup game with George Pinnell…and then he locate the firework launcher. Then he’d disappear. 15 minutes later, there’d be a big BOOM out towards the street. The next day, some kids that lived at the end of Agate Street saw him walking home from the West End. “Jack…we know that was you last night,”. Concerning the above picture of Jack and Tim in their MacMeda letterman jackets and the Girard/Coast Blvd sign: First of all that is Albie Cela’T’a, not Cela’D’a. Albie Celata, Class of 1958 at La Jolla High School, and long time friend and beer drinker with Jack, was also a constant bicylce alley cruiser in Pacific Beach and Mission Beach. One morning Albie spotted the street sign in a dumpster near Crystal Pier and brought it home on his bike, and then took the street sign down to our home south of San Felipe expressly for Jack and his MacMeda group that ventured to our home for New Year’s, and around March 18th for what we called “Winter Camp”. Lot of good times down there but milder than early Summer Camp adventures. Jack always brought lots of fireworks for New Year’s and we did have the best show on the beach. And the street sign definitely made Jack’s day when he saw it. We now have a piece of LaJolla here in Escalante, Utah where the street sign now calls home. And, of course there is a MacMeda sticker in Albie’s workshop. Does anyone have Mac’s pickled egg recipe? The crew posing with the Corvette at Windansea needs a positive I.D .Left to right:Dudly Diggs,John Pirie,Jack Macpherson,Bob Bernard,Mike McCartney,Julie “H”Johnson,Bob Baker,Bob Weinteer.Behind the Corvette:Blackie Hoffmann and Ronnie “Snowman”Hodges on Blackies shoulders.Also the Corvette,which I believe was a 60 or 61,belonged to Bob Moore who took the picture.As for shorebreak, Jack Mac,Bob Bernard and myself,were basically the only ones taking off at Windansea and Marine St.as we didn’t see anyone else trying the bigger waves. That was circa 1954.Thanks,John Pirie. I’ve known people whose nicknames are “Crazy” and deserving so. Rackstraw was crazier than all of them and flat out dangerous. by prancing around and eating a banana. Bob was more than a prankster. He was absolutley crazy.